Spleen is located in the left subcostal area. We examine it by patient lying on his back or on his right hip. The probe should be placed dorsolaterally parallel with intercostal spaces. 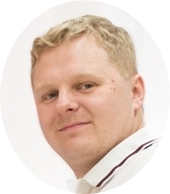 The examination could be more transparent by exspiration. 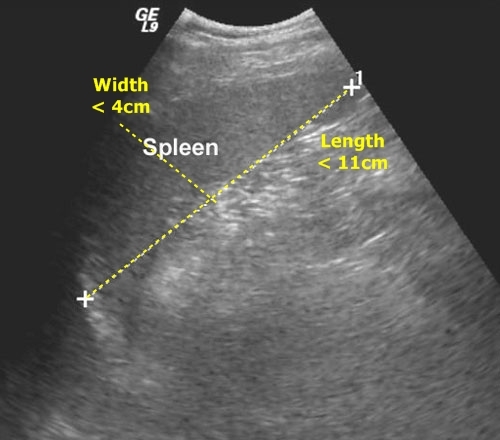 Spleen in classic picture with marked diameters. Above the diaphragm there is already the pleural cavity. Spleen enlargement – Splenomegaly is found by many diseases (blood diseases, infections, portal hypertension and other). When there is a distinct splenomegaly found we should also check abdominal areas with possible lymph node enlargements (periaortal space, liver hilum etc.). 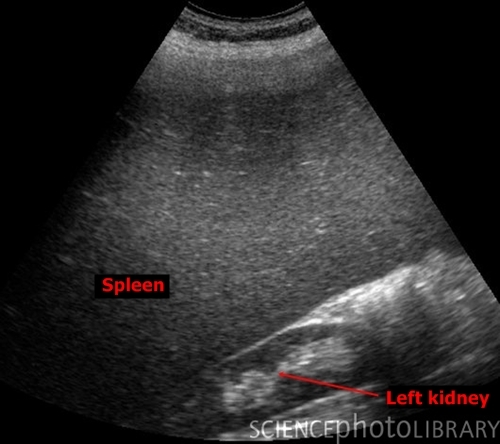 Splenomegaly - In this picture we can see the affinity between spleen and left kidney. We can not measure just from such picture, but spleen is undoubtedly enlarged. Spleen infarction –They look like hypoechogenic zones in spleen tissue. No blood flow into such parts can be confirmed by duplex sonography. is no color signal from the ischaemic area. 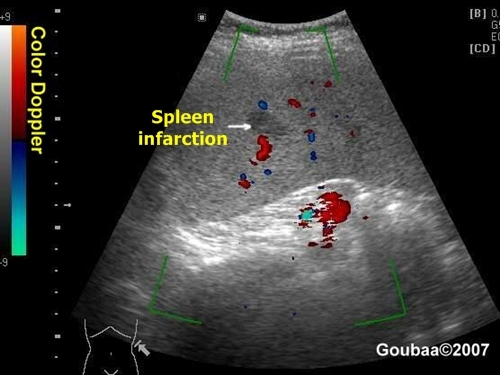 Spleen hematoma – It is important to diagnose or exclude them after suspected abdominal traumas. They look like hypoechogenic areas. Dorsal from upper (medial) pole of the spleen we have to check for fluid - blood (anechogenic). 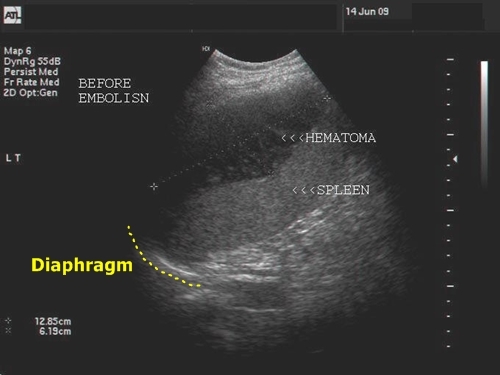 hematoma between the spleen and diaphragm. Spleen hemangioma – They look like hyperechogenic bright areas. They can resemble calcifications. 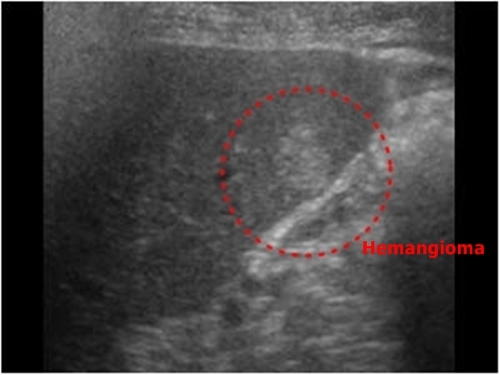 Spleen hemangioma - Hyperechogenic bearing is marked by a circle. Spleen cysts – They look like classic anechogenic regular round objects. They are less frequent than the liver cysts.